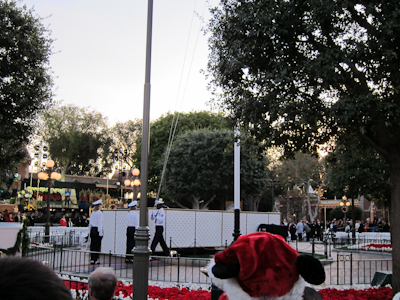 Disneyland has some pretty awesome traditions, and pretty awesome things to see in Town Square (which is the area around the flag pole when you first enter the park and duck under the bridges). 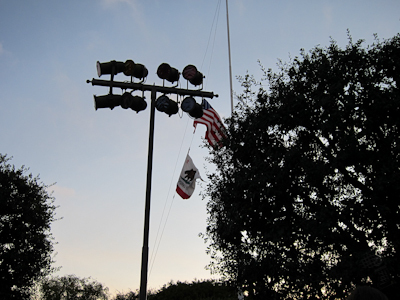 The flag retreat ceremony on September 11th was really moving. 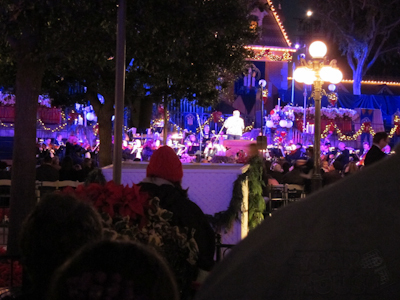 Tonight I got to see the Candlelight Processional and wow. I mean WOW. Disneyland did not disappoint. 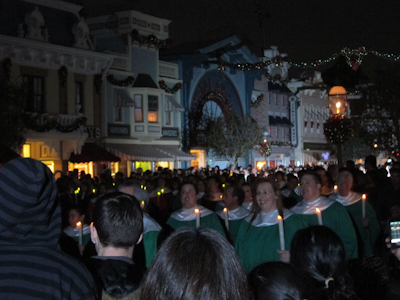 The Candlelight Processional started in 1958 by Walt himself. 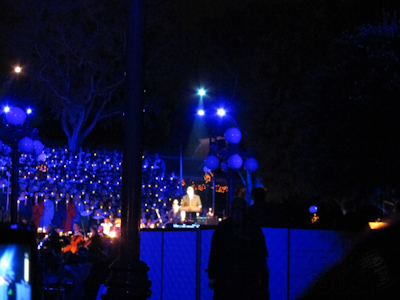 It consists of live musicians and a choir of over 600 people–many high school students–and a celebrity narrator. 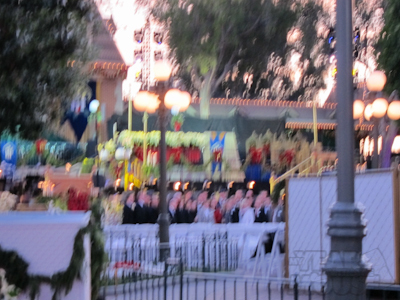 This year’s narrator was Gary Sinise. There were 4 performances this year, at 5:30 and 8:00 Saturday and Sunday. 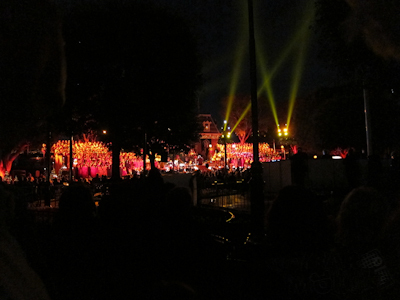 I needed to renew my pass so I headed over early and hoped to maybe make the 5:30 performance, but the 8:00 for sure. I got lucky, arriving at 4:30 finding a quite good spot in the roped-off area. 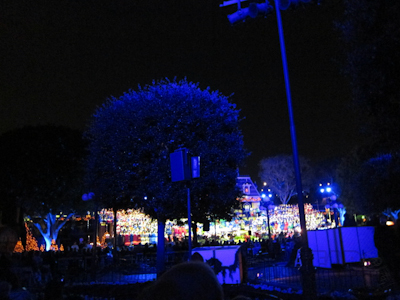 In true Disneyland fashion, I stood in my little spot and made friends with the people around me. 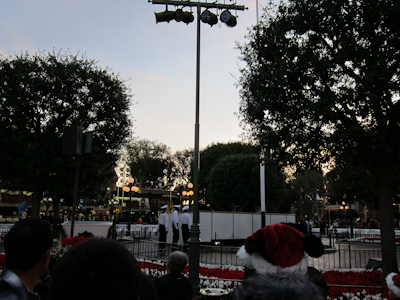 As it started to get dark, a small honor guard came out for the flag retreat. Usually they call up members of the armed forces (go Zach!!!) but this year they couldn’t since the entire area was roped off. As the flag came down they played the national anthem. Let me just take a moment to say that I love our national anthem. I really do. However, sometimes I wish they had picked something a little easier to sing. Official-looking people started to congregate up at the stage area. As the sun went down they also lit up the Christmas tree. 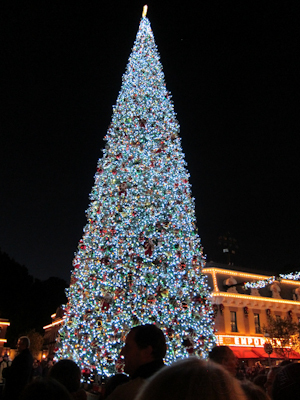 I got a sweet shot of the tree right at the moment when they lit the whole thing up! After that things started happening up front. 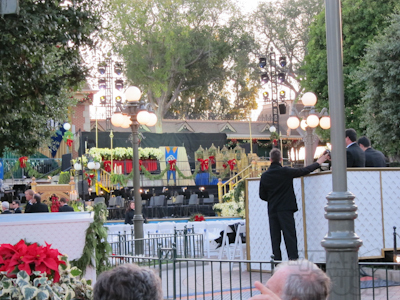 The musicians were all set up and the lights on Main Street were dimmed, so we knew the singers were on their way. The performers were shrouded in darkness, which made the “candles” look super cool. They started lighting up the choir in different colors as they sang traditional songs. Then the celebrity stepped up. As you can clearly see from the picture, it was Gary Sinise. 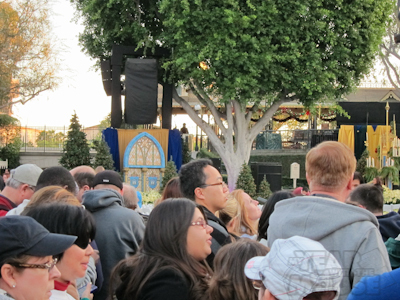 He read the “Christmas Story.” Normally Disneyland likes to be as inclusive as possible (when lighting up the tree everyone shouts “Happy Holidays!”) but in keeping with the tradition of the Procession, most of the story came straight from the Bible (the Gospel of Luke, to be specific). In between parts of the readings, the choir joined in with traditional songs. There was also a hand bell choir from Claremont United Church of Christ (UCC represent!! ), which was just lovely. The blue lights were super cool too. 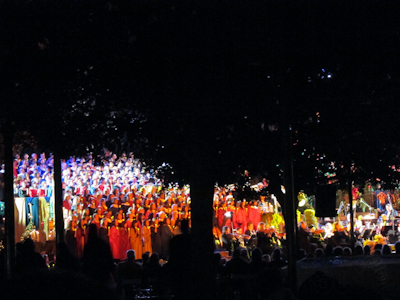 Here’s an amazing picture that shows the whole choir and also the tree obscuring some of my view. At that point I followed my own policy and put the camera down to enjoy the show in real time. There were three soloists and I’ll admit I cried a bit during the audience participation rendition of Silent Night. Everyone stood for the Hallelujah Chorus from Handel’s Messiah, and they wrapped up the performance with an amazing rendition of Joy to the World. 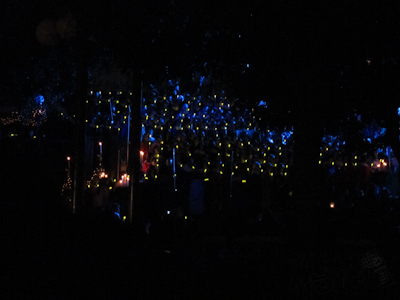 The Candlelight Procession was truly a sight to behold, and I have to say that I never would have done it without this blog, so thank you, MYWTM readers! Although my viewing spot was clearly not ideal, I was able to see everything except for the trumpeters on the roof of the train station, and that totally worked for me. I would definitely recommend the Procession to everyone. The joined voices of the choir just blew me away. 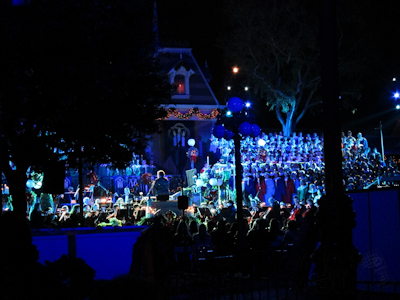 Even just reading your post makes me tear up….one of my favorite traditions at Disneyland, and I was so bummed we just could not get down there this weekend……SOOOOOO glad you were able to experience this truly magical event! It looks like it was a great event. Is this a ticketed event like the Halloween Party or is anyone in the parks the day it is happening invited? Good question! It’s open to everyone. The performance itself is about an hour. There is extremely limited seating–chairs set up filled with VIPs, “community leaders,” and people who paid $2,500 each for an “Adventures By Disney” package that included a stay at the Grand Californian, a tour of Walt’s apartment, and prime seating. The leftover seats go to people who get in line way early. Everyone else can catch standing room spots (just like parades and such). 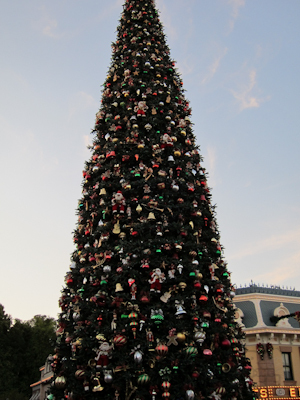 As you can see, I had a nice tree blocking half of my view, but other than that I got a pretty good standing spot! Have never experienced this before. I’m adding this event to the Disney World “bucket list”.